Cauliflower, along with potatoes and eggplant, is a staple vegetable in the Indian diet. Indian spiced cauliflower with ginger and cumin from The New Indian Slow Cooker by Neela Paniz is as easy as it is delicious. The key to this recipe is the cumin oil. Cumin seeds are fried in hot oil to release their flavor and aroma. The oil is then added to the slow cooker with the cauliflower, chilies, ginger and tomato. The mixture is cooked over low heat for 3 hours before it's ready to serve. I like to pair the spiced cauliflower with rice cooked with peas and potatoes, cucumber raita, and naan bread. One of the first vegetables I learned to cook from my aunt Vrinda was gobi sabzi, sautéed cauliflower. My family loves it so much that we cook it at least once a week. Try leftovers cold between two slices of toast with a slice of havarti cheese: it’s a perfect snack for a picnic or a long drive. 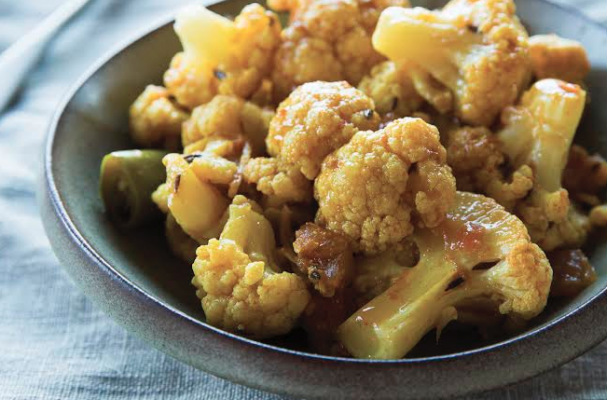 Cauliflower needs to be browned on low heat to help caramelize its sugar and bring out its natural flavor; it’s traditionally cooked in a karahi or Indian wok. My version here adds tomatoes, then stir-fries the vegetables in a skillet on high heat at the time of serving, reducing the moisture and at the same time browning the cauliflower. Cut the cauliflower into bite-size florets. Use the peeled and diced core and young leaves, too. Heat the oil in a small skillet on high heat, with a lid handy. Tilt the pan to form a pool and carefully add the cumin seeds; cover immediately to avoid splattering. When they finish sputtering, transfer to the heated insert of the slow cooker. Add the serrano chiles, ginger, coriander, ground red chile, turmeric, salt, and tomato, and mix well. Cook on low for 3 hours. If possible, stir once or twice. The cauliflower should still be firm to the touch. When ready to serve, transfer the cauliflower with all the juices to a large skillet or sauté pan on high heat and stir-fry until the moisture has been completely absorbed or evaporated. Garnish with cilantro and serve. Reprinted with permission from The New Indian Slow Cooker by Neela Paniz (Ten Speed Press, © 2014). Photo Credit: Eva Kolenko.